The new M22 rifle from SMK is a rugged and powerful PCP air rifle from well established British air gun firm SMK. The M22 features a solid and smooth bolt action system which actuates a 10 shot pellet magazine for quick and clean reloading. This is also a massive help when out hunting as you can quickly reload the next shot for a follow up shot. Alternatively the wide breech assists in single shot loading so if you want to do a spot of target shooting this rifle is quite capable. 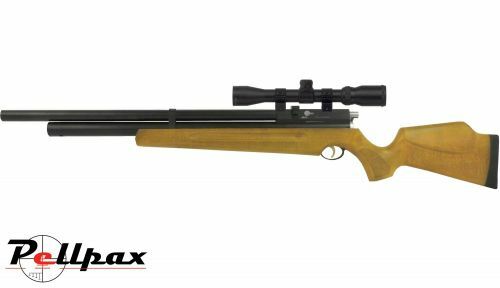 The rifle features a quick fill port at the front of the cylinder, and also has a pressure gauge fitted so you always know how much pressure you have left. The top of the breech is grooved with a 9-11mm scope rail for the fitting of the scope, and no open sights are fitted as this rifle has a shrouded barrel to assist in noise reduction. Please note: This rifle comes supplied with the fill adaptor, but to connect it to a 1/8th hose, you will also require a quick fill connector socket, which you can purchase under the 'Accessories' section under 'Customize & Buy' if you do not already have one.